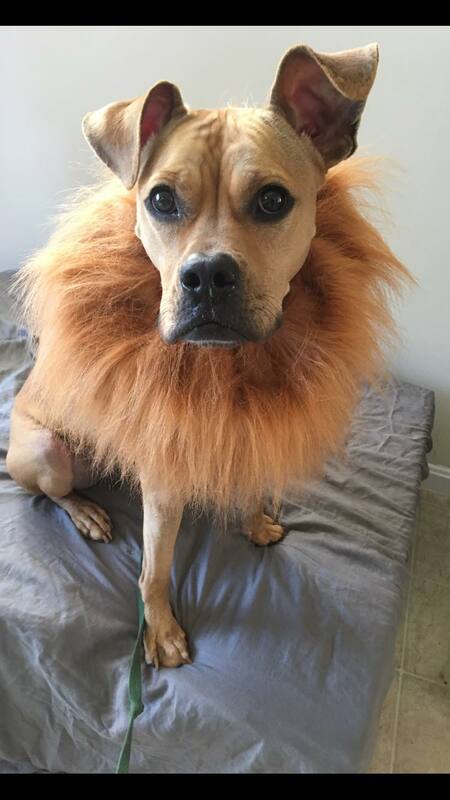 We Asked Our Readers for their Best Halloween Pet Pics, and we were NOT disappointed. 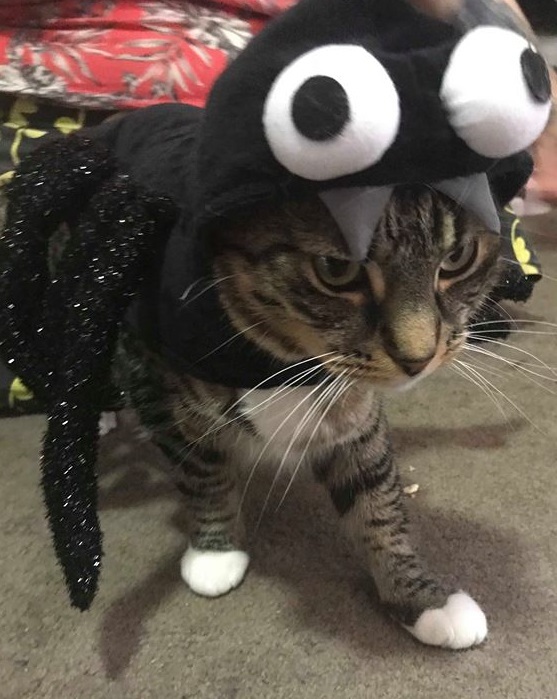 I don’t care what you say: Halloween is the greatest time of year. And I don’t care that we’re Australian, and Halloween is typically an American thing: it’s actually a pagan thing, if we go back in time. 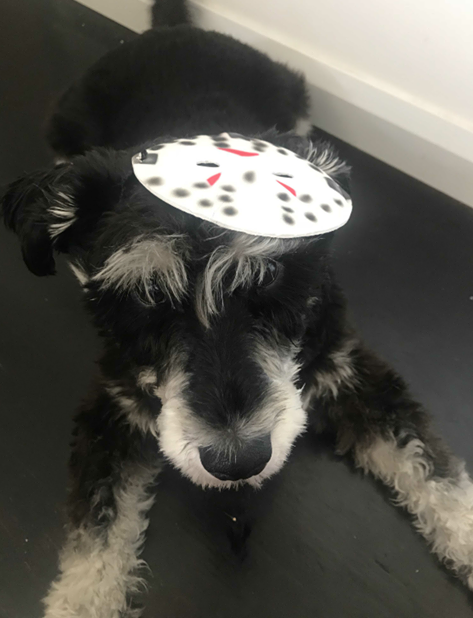 Besides, dressing up is fun, and candy is tasty–and what better way to commemorate the day than dress up our furry friends (for which they may or may not kill us in our sleep). 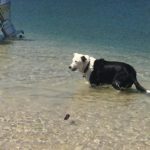 Some of you might remember Hex from one of our previous pieces about Hex: the ‘unadoptable’ pup who found love in the form of her owners Hilary and Yev. 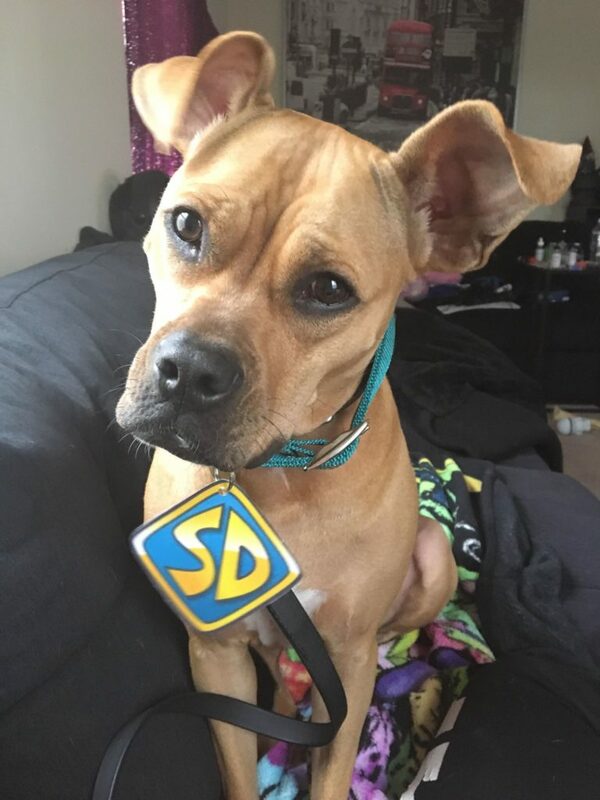 With training and support, Hex is doing very well, and will do almost anything for a Scooby Snack. 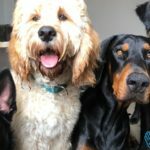 “She was an actual angel,” owner Hilary told PetsOnMe. Hex also makes a pretty ravishing lion, with her bravery and heart of gold. 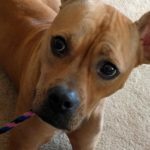 We’re so happy Hex found her forever home. Image supplied. And in case you’re wondering, yes, Hex did eventually get her well-deserved Scooby Snack! Next, we have the amazing changing 20-month-old schnauzer Louis! 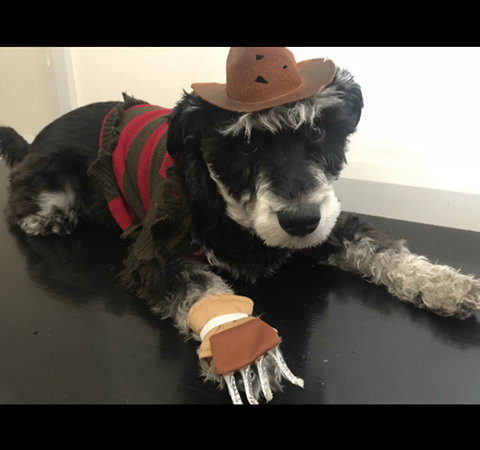 While he might not presently resemble your typical schnauzer at the moment due to a beard trimming incident, Louis looks quite serious putting on a show for his owner Kate–for a treat, of course! 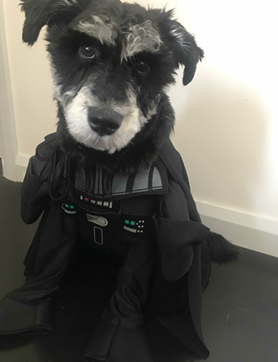 It’s a Darth Vader dog! My life is complete. Image supplied. 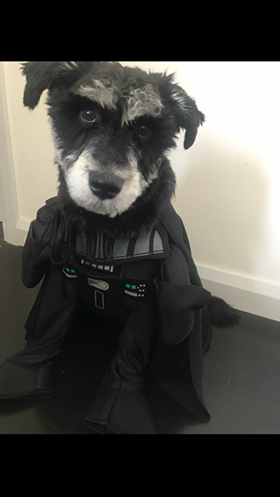 Lucky Louis is set to be the best dressed former Jedi in the galaxy with this outfit–one he’ll debut at a Wollongong doggy daycare Halloween party. 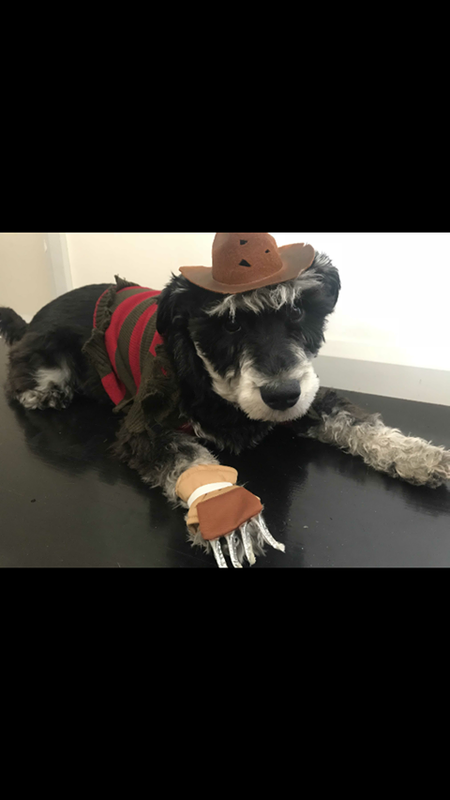 His owner Kate, who runs her own candle business from home, isn’t taking any chances and is even bringing back-up costumes of Freddy Krueger and Jason to dress into, just in case. One, two, Louis’s coming for you. Image supplied. Kate says Louis is incredibly well-behaved when it comes to dress ups–and believes he actually quite likes it! “He runs around and does little poses,” she told PetsOnMe. 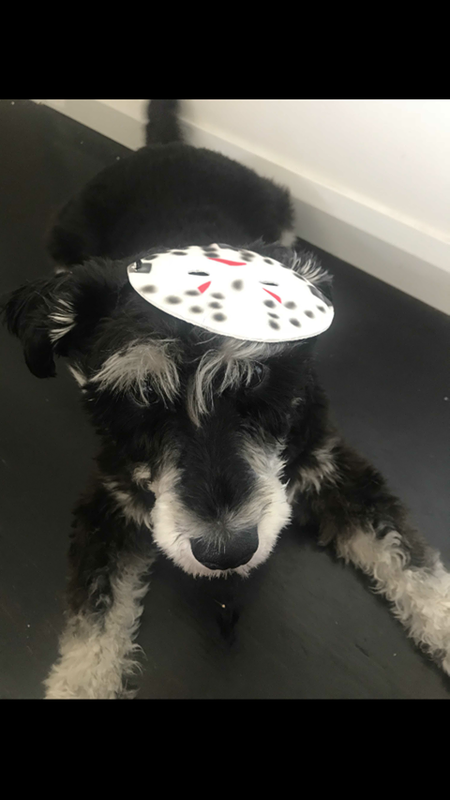 A Jason mask has never looked so cute! Image supplied. TBH, outfit goals. Yates looks absolutely adorable (if somewhat unimpressed). Image supplied. 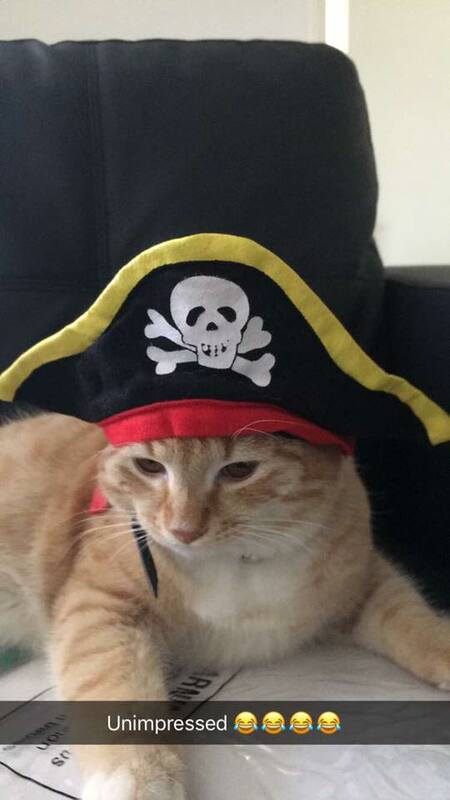 Two-year-old brothers Yates and Zeke look like they’re questioning their life choices in these adorable pirate pics. “I don’t think they were overly impressed!” owner Emily told PetsOnMe. 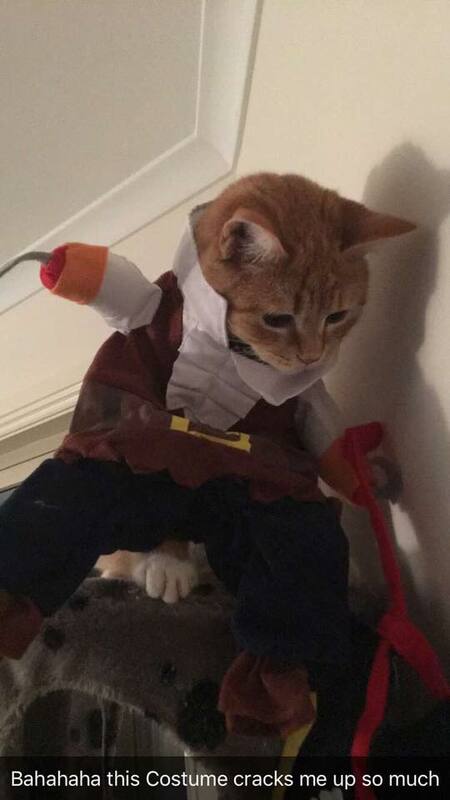 Arrrrr. 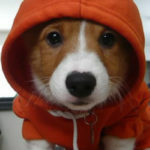 As in, when arrrrrrre you going to let me out of this outfit? But seriously, look at those paws. Image supplied. Regardless, they’re still the cutest pirates I’ve ever seen! 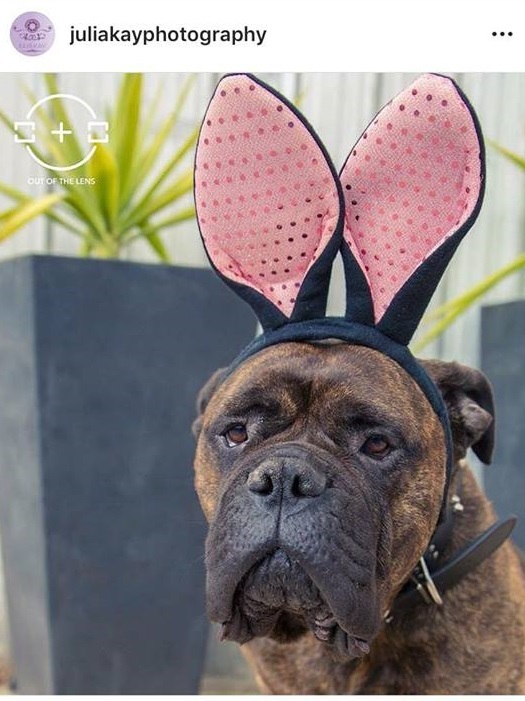 Photographer Julia’s 8-year-old bull-mastiff Kairi hates being dressed up–but will tolerate it out of love for their owner, for a short period of time. Is it a bunny? Is it a dog? Well, they’re definitely adorable! Image via Julia Kay Photography. American staffys Bossy, 6, and her son Ace, 2, love dress ups–and they certainly look super suave in these outfits! We think Bossy looks pretty super here! Image supplied. “They’ve got so many different outfits,” owner Chloe told PetsOnMe. 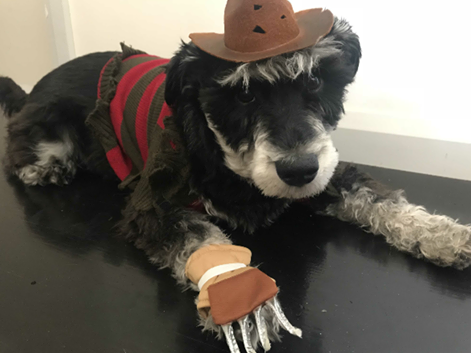 So, a puppy in a suit isn’t really Halloween. 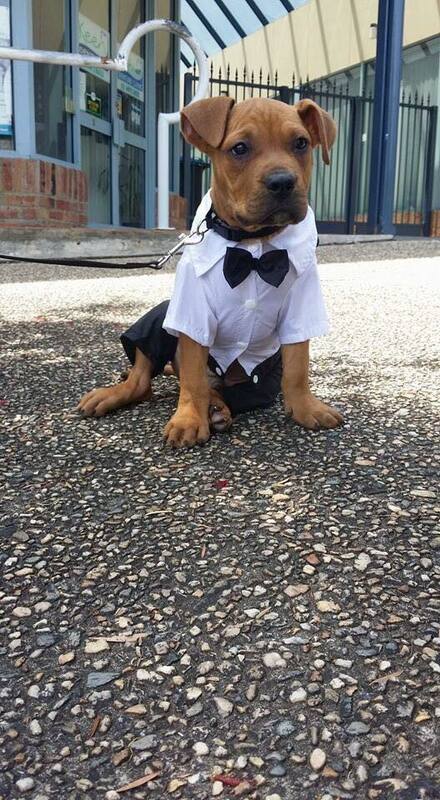 But come on: it’s a puppy with a suit! Image supplied. Chloe dresses the little family, and their father Ace (not pictured) in different pyjamas, cardigans and hoodies–she’s even dressed them up as fruit before, with the trio frequently dressing as strawberries and bananas. Two-year-old sibling cats Lara (Croft) and Gomez (Addams) couldn’t be more different. 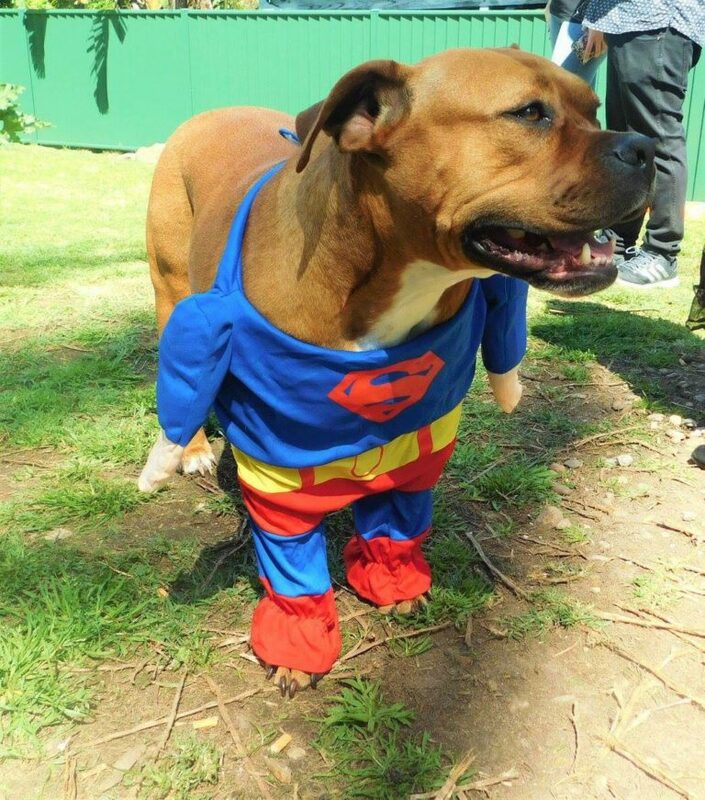 But one thing they can agree on is that dress-ups are not as fun for humans as they are for their pets. Lara is plotting our demise. Image supplied. Maybe, just maybe, this is why they pee on our beds. 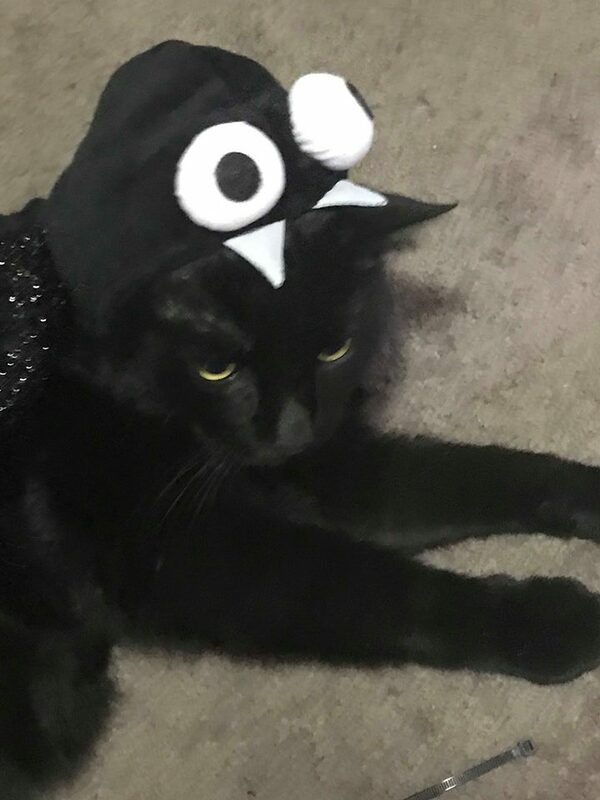 While he may not look like it, Gomez was far more relaxed in being dressed–once we were able to get the costume over his food belly. Is he plotting to murder us in our sleep? Or just thinking about the snacks he’s about to eat? Image supplied. If looks could kill, am I right? Zoe Simmons is a journalist with a passion for all things wacky and strange. Check our her Facebook Zoe Simmons Journalism for more! 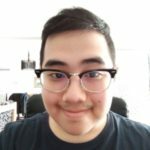 Thinking about owning a pet? Try Pet-Sitting first. 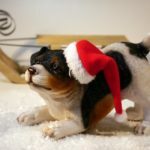 8 Christmas Presents Ideas for your Favourite Pooch.